There’s a new badge in the land of crime fiction… and it’s pinned on a man who can stand tall alongside lawmen like Raylan Givens, Walt Longmire, and Jesse Stone. Sheriff Colt Harper lives by his own moral code. His relentless crusade against drug crimes in his rural Mississippi county infuriates a Memphis mobster who sends Hack, his cold-blooded assassin, to stop him. ATF Special Agent Molly McDonough, looking to save her troubled career, follows Hack’s trail of corpses to Harper’s turf. The fates of Harper, McDonough and Hack collide in a bloody, brutal showdown for justice, redemption and survival that can only be fought outside the law. 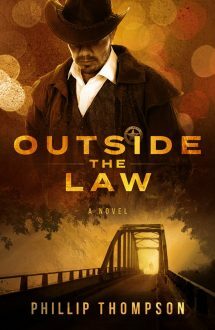 OUTSIDE THE LAW is a winner in the tradition of JUSTIFIED and WALKING TALL. There’s right and there’s wrong and the no man’s land in between. Thompson explores them all, but it’s the reader who gets the big payoff in the end. Reed Farrel Coleman, New York Times bestselling author of "Robert B. Parker’s Debt To Pay"
If you’re a fan of "Justified," you're going to love "Outside the Law." Sheriff Colt Harper is an old-West gunfighter in the modern world. The action doesn’t stop. David Morrell, New York Times bestselling author of "First Blood"
Pure entertainment with an edge. The guy can write! Through the deeply flawed character of Sheriff Colt Harper, Phillip Thompson explores Larry Brown’s rough south, digging deeper and seeking a truce with the interloping outside world, and Harper’s tormented inner world as well. Thompson writes about the tendency of a good man toward violence. The need to seek redemption for the sins of the past—even if that redemption is through more violence. Maybe especially. Outside the Law is my kind of book, and Phillip Thompson’s Mississippi is a rough south indeed. One I hope he’ll revisit. Grant Jerkins, author of "Done in One" and "A Very Simple Crime"
OUTSIDE THE LAW marks the long-awaited return of Colt Harper, Phillip Thompson’s hardened Mississippi sheriff dispensing his own brutal brand of justice. It is quintessential Thompson: dialogue flammable as a jar of white lightning, characters real enough to punch in the face, and a plot with more twists than a Mississippi black snake. This book is perfect for folks who weren’t ready for JUSTIFIED to end. Erik Pruitt, author of "Hashtag"
Jim Sanderson, author of "El Camino Del Rio"
Thompson provides lots of gunplay, snappy dialogue, and plenty of intriguing characters. Bill Crider, author of "Outrage at Blanco"